Having a solid foundation is needed in order to build and grow. Applying this ideology to learning leads to success in every school subject, especially English. To have a solid understanding of English, students need to fully develop their foundational English skills: grammar, phonics, reading comprehension, and vocabulary. You can think of these skills as building blocks. In order to build higher and learn more, these foundational English skills must be strong and fully developed to support the rest of the knowledge English classes present. 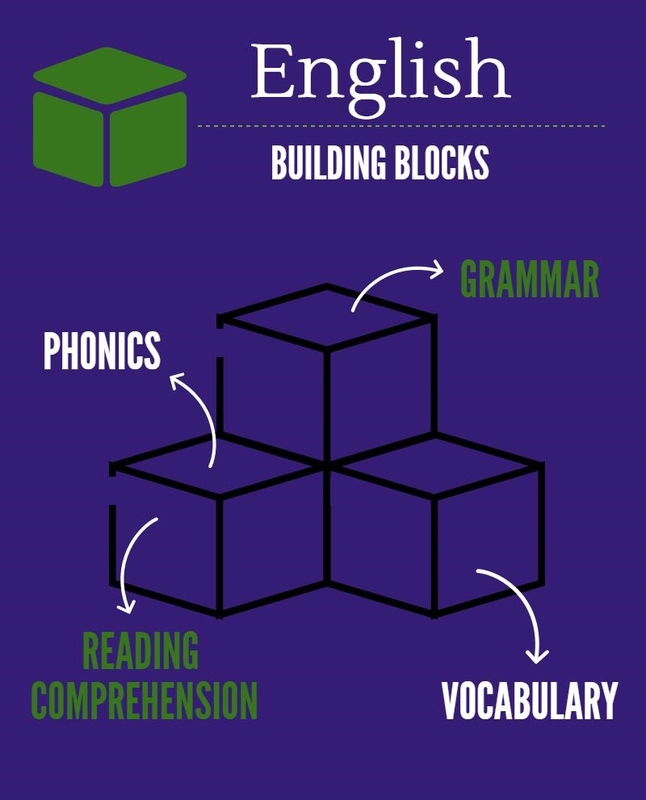 The building blocks of English are represented in the graphic below. Grammar is the set of rules for word usage (how to use words, construct a sentence, capitalize words, and punctuate properly). By knowing how words work together, students’ writing is clear and, therefore, stronger. To understand what a text is presenting, students must know how grammar rules like tense, subject-verb agreement, etc. influence the text’s meaning. Speaking with proper grammar makes someone’s words more convincing and understandable. This is especially important when trying to express one’s ideas and give presentations in school. That is one way that English skills can help students excel in other subjects, as well. Phonics is the relationship between sounds and letters. This knowledge is needed when recalling words and deciphering new ones. In order to learn new words, a student must understand how sounds work together. As students get older, the words they come across become more challenging, but pronouncing new words is an easier task if the student has the strong understanding of phonics. Reading comprehension is understanding the words being read, separately, together, and in the given context. Readings become denser as students progress through school. To understand the abstract and challenging ideas presented in readings, it is necessary for students to be able to accurately process what they are reading. This is not only important in English class like when reading texts, but also for every other subject. Whether it be reading directions, word problems, writings, etc., reading comprehension is applicable to every school subject. Furthermore, having a solid understanding of grammar and phonics with a vibrant vocabulary (building blocks 1, 2, and 4) makes reading enjoyable and affective. Vocabulary is the set of words understood by someone. Developing vocabulary presents the opportunity for greater reading comprehension, writing and speaking skills. A great number of words are related to one another, so learning the roots of words and becoming familiar with affixes helps students make knowledgeable inferences about new words they come across. Having a rich vocabulary makes their writing and speaking rich, as well. To learn English and be fully prepared for the demands that lay ahead of them, students need to develop foundational English skills. English lessons like those offered at A Grade Ahead are a great way to support students’ English skills by strengthening and fine tuning each of these building blocks. Are your child’s English building blocks strong? Is there an English building block your child needs to work on? Author: Sarah B., Writer and Teacher at A Grade Ahead.